I have this huge fascination with Rick Bayless. I LOVE LOVE LOVE his PBS show “Mexico: One Plate At A Time.” I haven’t yet had the chance to dine at his Chicago restaurants Frontera Grill or Topolobampo, so I do the next best thing. I follow him on Twitter. And Saturday night, he had the biggest diner of all come to Topolo. President Obama and the Secret Service stopped at the Clark Street restaurant for a bite to eat. They even stopped for photos with the kitchen staff. So what did the Commander-in-Chief order? Lobster and scallops in a roasted tomatillo-corn sauce with sweet corn tamales. When the President arrived, they closed off our block on Clark Street. I counted 13 vehicles filling the 3 lanes. 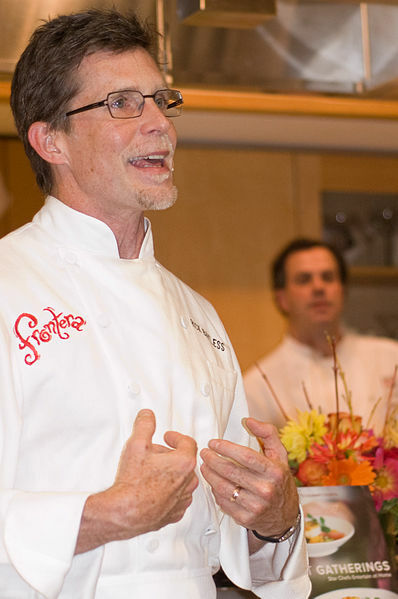 Want more from Rick Bayless? Follow him on Twitter @Rick_Bayless. Check out his PBS show, too. You’ll LOVE it! This entry was posted in Celebrity chefs, Cuisine - Mexican, Places - Chicago and tagged Barack Obama, Chicago, Clark Street, Frontera Grill, Mexico, One Plate at a Time, PBS, President, Rick Bayless, Topolobampo by Christina. Bookmark the permalink. Nice to meet your blog:) Just the thought of the president eating there is so cool. I love Rick Bayless-and know few who don’t! Thanks for checking the blog out Otehlia! I hope one day I can check out Rick’s restaurants.